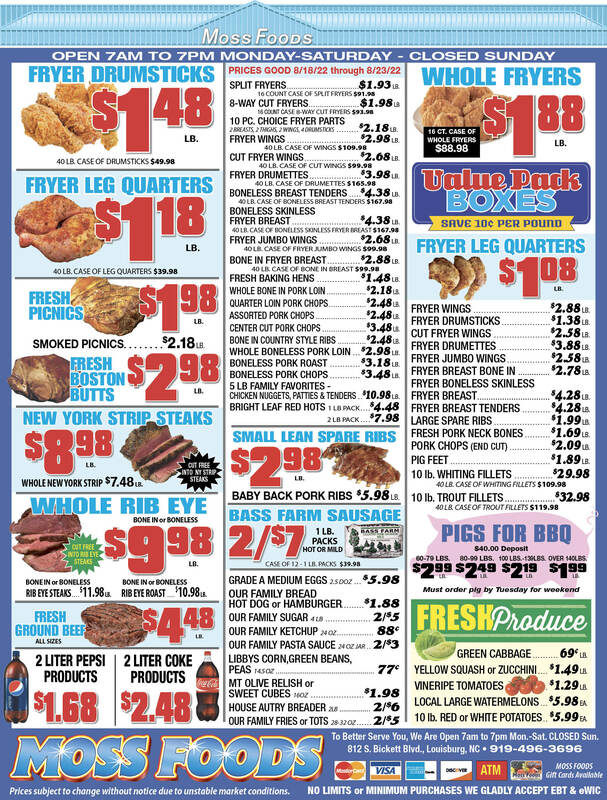 Showing 38 articles from January 20, 2016. From woodlot to dog park in barely the blink of an eye! Rain + mud + snow + even hiccups -- NO problem! LOUISBURG -- It took nearly every bit of 48 hours, but organizers and volunteers completed a makeover project at the animal shelter they hope spurs more pet adoptions. 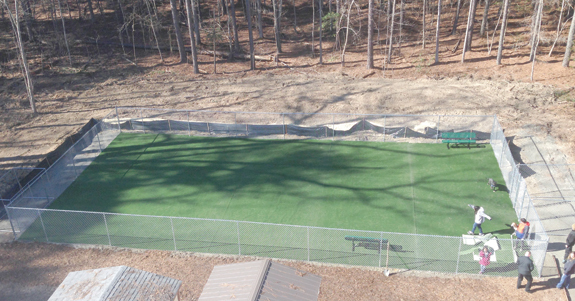 The Legacy Center -- a Raleigh-based leadership and community projects group -- spent weeks planning an extreme makeover of the county's animal shelter, including a dog park and 1/3-mile walking trail; with a two-day window to complete the $200,000 project. HONORED. 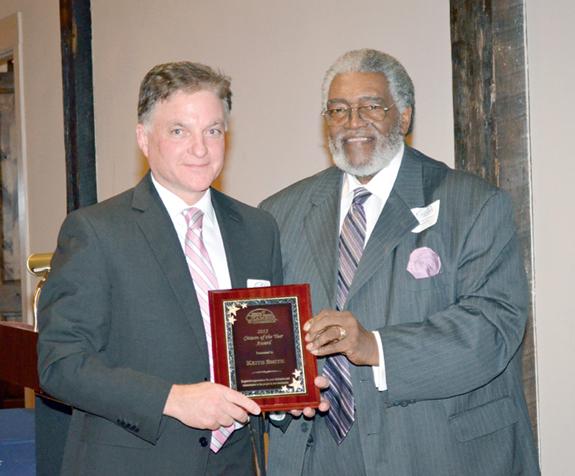 Keith Smith (left) receives the Citizen of the Year award from Joe Cutchins Jr., last year\'s winner. YOUNGSVILLE -- Keith Smith said he's prided himself on doing most of his good deeds behind the scenes. 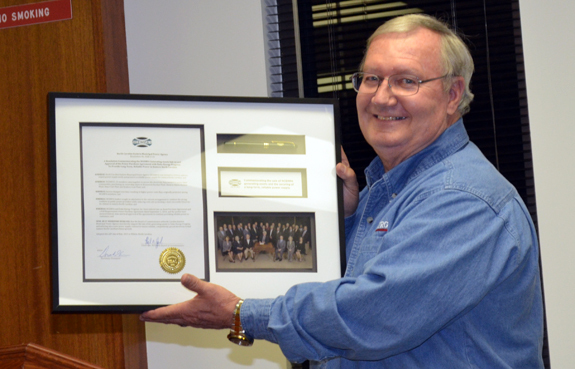 But during its annual banquet last Thursday, the Greater Franklin County Chamber of Commerce decided to place a spotlight on him -- tabbing him as the organization's 2015 Citizen of the Year. 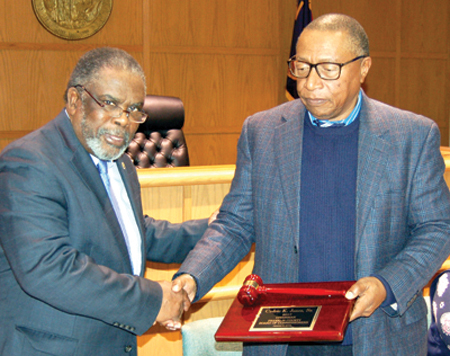 Smith was recognized for his civic duty, serving on a number of boards, helping launch the Boys and Girls Club in Franklin County, his business acumen, and work as a role model for troubled youth. Franklin County got some long-awaited good news from the North Carolina Department of Transportation late last week -- the construction of Section C of U.S. 401 finally has been funded. Construction of Section C, which runs from the Franklin-Wake county line north to the Royal crossroads is scheduled to begin by Fiscal Year 2019 -- and take about two years. The two-lane highway will be increased to four lanes in a Super Street design format, engineers said, similar to the design used on the Rolesville Bypass. LOUISBURG -- The newly, officially constituted Board of Elections approved an early voting plan that will let voters take advantage of a full Saturday to cast an early ballot. The Tuesday decision comes more than two weeks after a 2-1 vote on Dec. 30 that did not include a full Saturday of early voting. Board member James Jones cast that lone dissenting vote and apparently was able to persuade Board Chair Thomas Bregger and member Amy Southerland to switch their vote. Finally, after 50 years of struggle, the North Carolina Department of Transportation has agreed to four-lane at least part of U.S. 401 in Franklin County, the part from the Wake, Franklin County line north to Royal. Known as Section C, the highway improvements are scheduled to begin by 2019, although because the highway is designed and most of the right of way purchased, that timetable could be moved up, especially if other projects that are ahead of it aren't quite as "shovel ready" as 401. It's only about two weeks until the BIG game -- but an even bigger game is scheduled to "kick off" in about six weeks! As everyone knows, we're down to four teams in the annual march to the big NFL game that we're not supposed to actually call by name because it's inexplicably copyrighted! But while that holds much of the nation's focus at the moment, a much larger "game" is reaching a fever pitch that, for us Tar Heels, will begin to take shape when early voting begins March 3. Well, I'm back at work, so, obviously, I didn't win the $1.5 billion lottery. I'm really bummed because I had already picked out the color for my private jet -- it was going to be invisible -- and I had already fired up Google Earth to select the island I was going to buy and rename Blissville. But, alas, I was not so fortunate. But I wasn't just bummed for me. Schools' 'measuring stick' uses different size inches! I am a fan of the public education system. I make no apologies for that! Education is the biggest controllable predictor of upward social mobility in America. The only larger factor is who your parents are and we have no control over that. Making a quality education available to all is simply good business. Oh, sorry, that business is closed! Over the years I have attended many Franklin County government meetings. My interest in doing so is varied and has evolved. Once a passive curiosity, my interest has grown to a genuine concern for our community, and more specifically, for our youth. 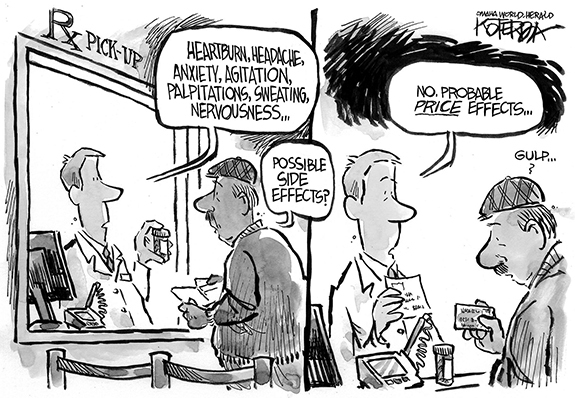 It is a concern others share. The silent majority will not voice it, the question is why? If you are one of these people you know your reason. LOUISBURG - Elizabeth Winn May, 100, of Louisburg, died Tuesday morning. LOUISBURG - Funeral services for Lena Mc-Knight, 64, who died Sunday, Jan. 17, 2016, will be held at 1 p.m. Sunday, Jan. 24, in the Richardson Funeral Home Chapel in Louisburg. Burial will follow in the Cedar Rock Church cemetery. LOUISBURG - Leona Burnette Thompson, 85, of Louisburg, died Tuesday afternoon. BUNN- Memorial services for Lydia Evans, 62, who died Sunday, Jan. 17, 2016, will be held Friday, Jan. 22, at 1 p.m. at New Hope Worship Center in Louisburg. READY TO WRESTLE. Franklinton's Hayes Tharrington engages a wrestler during last Saturday's mat action at the Jolly Roger Invitational Tournament at Corinth Holders High School in Johnston County. WENDELL -- A jolly old time was enjoyed by the Franklinton High School wrestling squad at the annual Jolly Roger Invitational Wrestling Tournament. The event, held each year at Corinth Holders High School, features some of the area's top mat performers competing in an individual format. Franklinton stood up to the lofty challenge and excelled under veteran head coach Alan Carter. 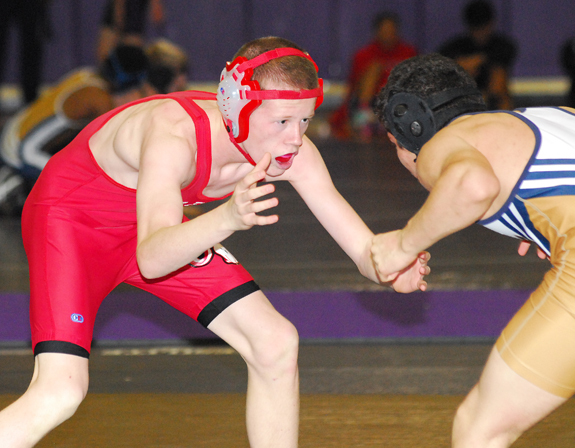 The star-studded field showcased an impressive list of winners, and that included Franklinton's Daniel Mickschutz, who earned a first-place medal in the 113-pound weight class. BALL CONTROL. Louisburg College's Tashayla Smith (middle) tries to hang on to the ball during last Saturday's home game against Cape Fear CC. 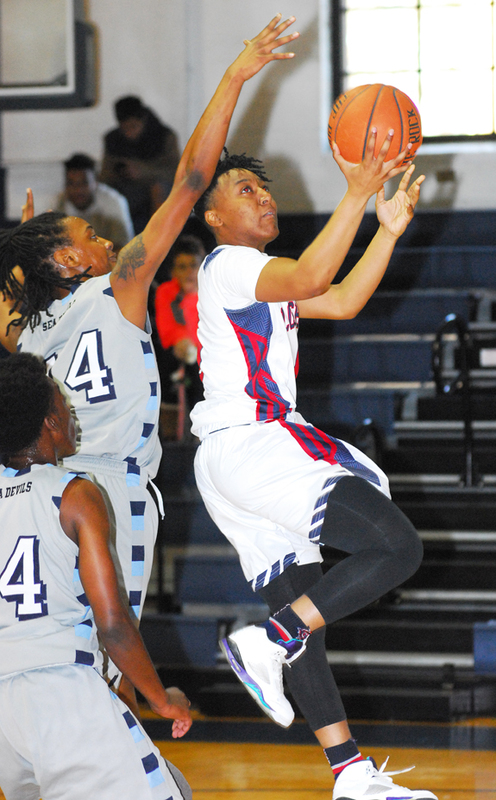 LOUISBURG - Following a break of almost one full month, the Louisburg College Lady Hurricanes finally returned to the court last Saturday for Region X basketball action. And LC's initial test of the 2016 calendar year promised to be a challenging one as the Lady Hurricanes tangled with Cape Fear Community College at Taylor Center on the LC campus. STICKY DEFENSE. 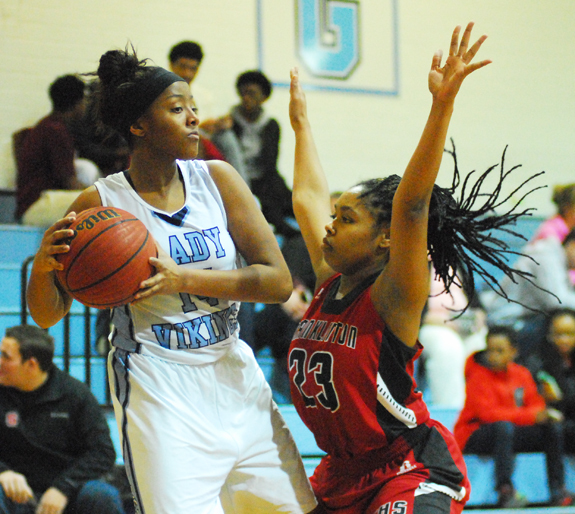 LaMonika Morrison (right) provides the pressure for Franklinton during Tuesday's road victory against South Granville. CREEDMOOR -- Franklinton wasn't about to be victimized by the fourth-quarter blues this time around. Two weeks ago, the Lady Rams dropped a key Northern Carolina Conference girls basketball game against North Carolina School of Science and Math, thanks in part to their inability to close out the contest with a strong final period. Facing another important game dotted with playoff implications, Franklinton made amends during a 36-34 road triumph Tuesday at league rival South Granville. DELTON DELIVERS. Delton Davis was effective for Franklinton during Tuesday's road decision against South Granville. 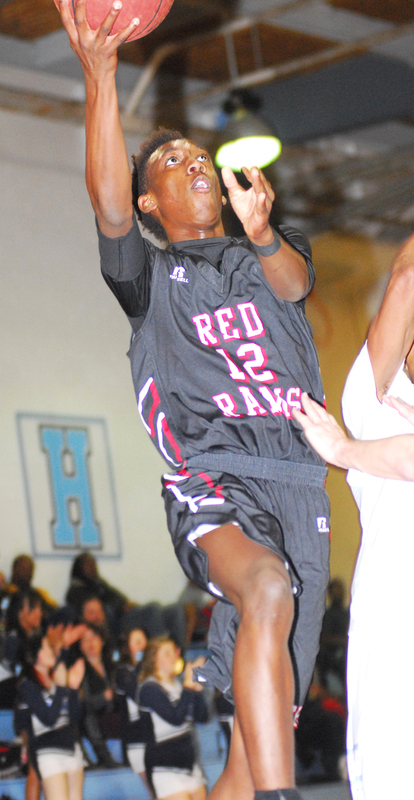 CREEDMOOR -- One team remains uncontested atop the Northern Carolina Conference boys basketball standings. And it's the Franklinton Red Rams. With first place in the league at stake on Tuesday, Franklinton delivered one of its biggest victories of the season -- a 67-61 road triumph at then co-leader South Granville. LOUISBURG -- After 47 days on the road, the Louisburg College Hurricanes returned to Taylor Center on a mission during Monday's Region X rematch against Vance-Granville. It has been since early December when LC last hosted a game, and the Hurricanes were ready to be home to tangle with the Vanguards. 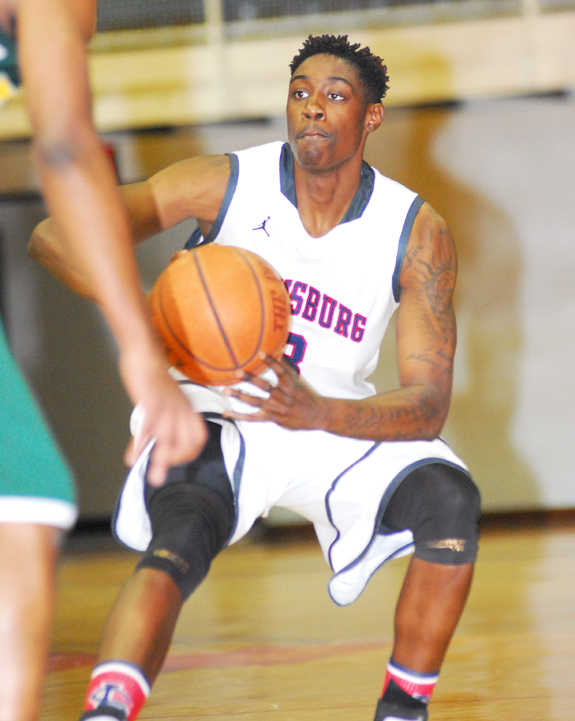 Louisburg soared to an early cushion and never looked back en route to securing a 101-53 decision over VGCC. FRANKLINTON -- One of Franklin County's least-kept secrets is the lofty football abilities of Franklinton High School sophomore Ricky Person. 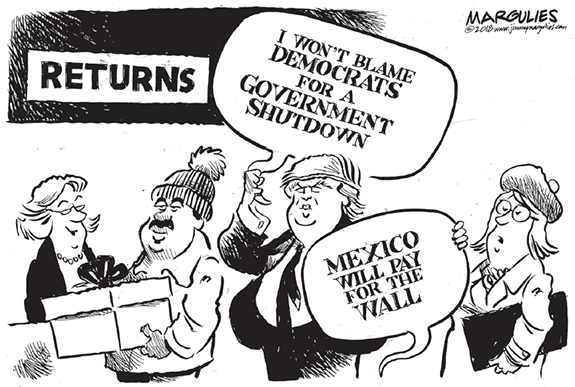 The rest of the United States is starting to catch on, too. 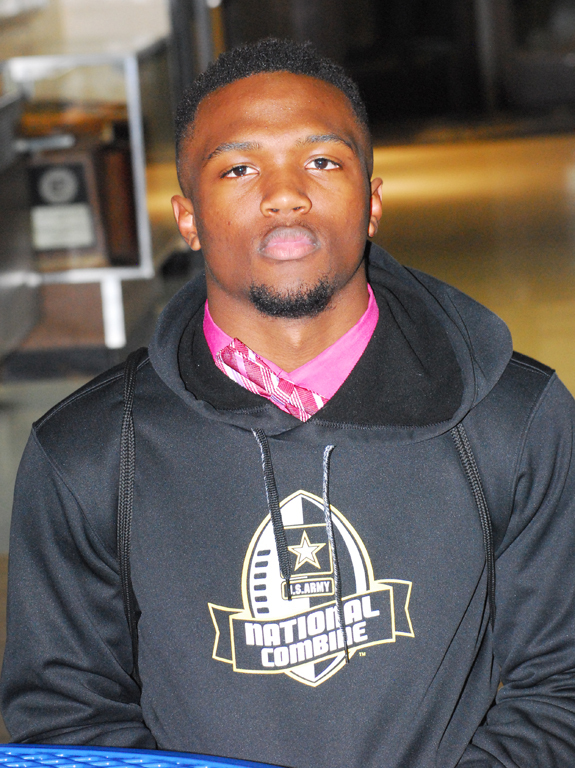 Last week, Person traveled to San Antonio, Texas, to take part in the annual U.S. Army Football Combine at the Alamo Dome. The combine, which featured some of the nation's top prep gridiron underclassmen, served as a prelude to last Saturday's All-American Bowl. LOUISBURG -- Michelle Carlson's first season as the Louisburg College softball coach will begin Feb. 20-21 with a four-game home series against Surry Community College at Sheilah R. Cotten Field on the LC campus. The Lady Hurricanes will enter the campaign as the defending Region X Tournament Champions. LC will also be competing with its third head coach in three seasons as Carlson accepted the position last summer after a successful stint as an assistant at Radford University -- her alma mater. FRANKLIN COUNTY -- Louisburg High School has picked the right time to come together during the 2015-16 boys basketball season. The red-hot Warriors continued their winning ways last Friday night by collecting a clutch 59-55 road decision at Granville Central in a Tar-Roanoke Athletic Conference showdown. Louisburg, now 8-6 overall, trailed by six points with four minutes to go before embarking on a 9-0 spurt that featured two treys from Kenan Epps, along with another trifecta from teammate Andreas Wilson. TOP HONOR. 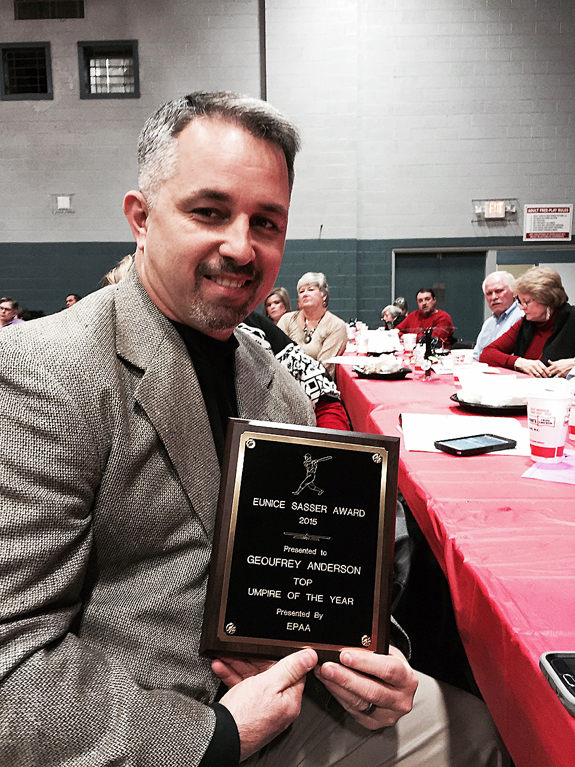 Bunn resident Geoufrey Anderson recently received the Eunice Sasser Award (Umpire of the Year) at the 2016 Wilson Hot Stove League Banquet. BUNN -- After stepping down after six seasons as Bunn High School's baseball coach, Geoufrey Anderson was looking for a way to remain close to the game he loved. He found it as an umpire in 2009. After taking two years off, Anderson returned to the diamond, but this time wearing a mask as opposed to a coach's uniform. ZEBULON -- The Carolina Mudcats and Muddy the Mudcat are happy to help fans show "someMuddy" how much they love them this year with their newly available Muddy's Valentine's Day Gift Packs. Muddy's Valentine's Day Packs are now available in a men's and women's version. Both packs will be delivered in person by Muddy the Mudcat on either February 12 (office delivery) or February 14 (home delivery) and include several terrific Valentine's Day themed items for $100. GREENVILLE -- East Carolina University's non-conference home baseball game against North Carolina State (April 19) will be nationally televised on the CBS Sports Network according to a release from the American Athletic Conference office. The contest, which is slated for a 6:30 p.m. start, is the first national broadcast from Lewis Field inside Clark-LeClair Stadium since May 3, 2014 when ECU hosted FIU on the Fox Sports Network. 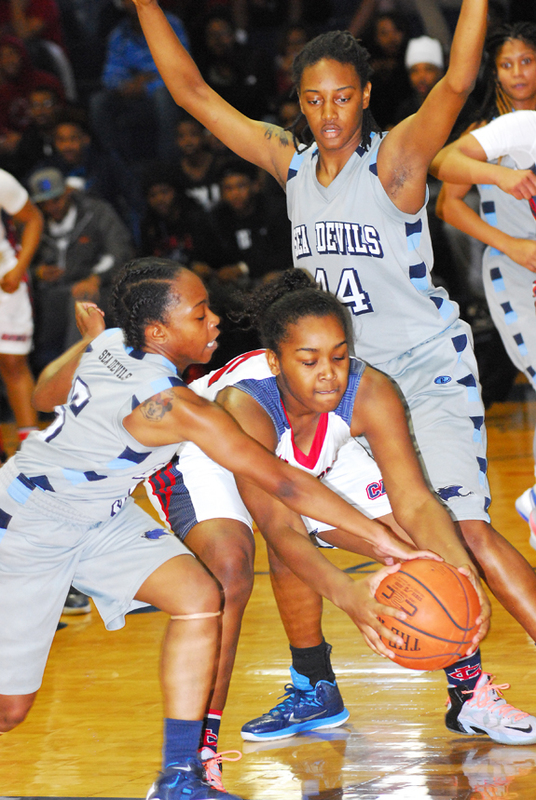 Louisburg's Jasmine Covington drives for a basket during last Saturday's home contest. Franklinton's Devin Younger (right) secures a hold during a match at last Saturday's Jolly Roger Invitational Wrestling Tournament at Corinth Holders. 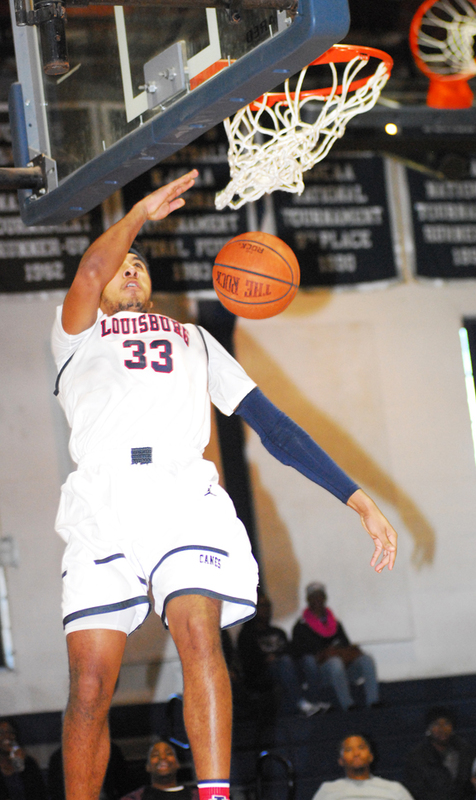 Vinny Agee sends down a dunk for Louisburg College. CULLOWHEE -- A total of 2,436 students have been named to the Western Carolina University dean's list for fall semester 2015, and 1,213 of those students also achieved an additional academic honor by being named to the chancellor's list for the fall semester. To qualify for the dean's list, students must achieve at least a 3.5 grade-point average out of a possible 4.0 on a regular semester's work of not less than 12 hours, excluding remedial courses, with no grade of D+, D, D-, F, or I. After honoring the Louisburg College men's soccer team, which recently won a national championship, the Louisburg Town Council quickly worked through an agenda of routine business Monday night. The soccer team was honored with a proclamation -- and each member of the team received a copy of the document commemorating their success and the town's appreciation for the way the team represented their school and the community. MARCH. 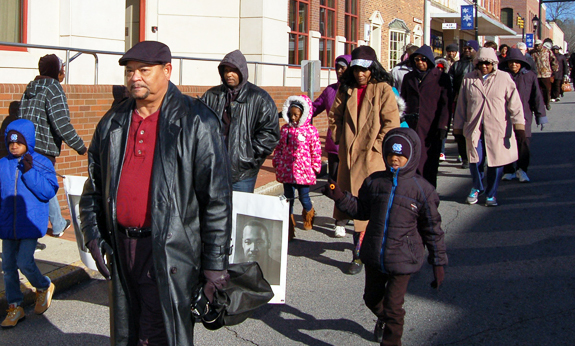 Joe Lynch leads a crowd of residents celebrating Dr. Martin Luther King Jr. Day in Louisburg on Monday. FRANKLIN COUNTY -- This past Saturday, Franklinton Mayor Pro Tem Anita Fuller unveiled a sign of change. And on Monday in Louisburg, Rep. Bobbie Richardson said signs of change need to continue at the ballot box this spring and fall. Both gestures and messages were delivered as part of events honoring the life and legacy of slain civil rights leader Dr. Martin Luther King Jr.
Organizers in Franklinton celebrated their 10th annual MLK celebration at First Baptist Church with the unveiling of the street signs -- believed to be the first public recognition of King's legacy anywhere in the county. LOUISBURG -- Local and federal authorities all signs point to a skydiving death over the weekend being an accident. According to reports, James Stremmel had gone up with a group at the Triangle Skydiving Center at the county's airport and was coming in for a landing. The chute apparently opened, but Stremmel, an experienced skydiver, had a hard landing and died. Stremmel, the skydiving center's operator said, had performed more than 1,800 jumps. Will new software fix radios? FRANKLIN COUNTY -- Franklin County switched over to its $11 million emergency radio system more than three years ago and bugs that plagued the system from the outset continue to give officers a rash of problems in the field. In the coming weeks, though, Franklin County Emergency Communications Director Christy Shearin said many of those problems should be eradicated. "Our focus for the next three to four weeks will be getting radios reprogrammed," Shearin told officers during the a Tuesday meeting of the Franklin County Association of Chiefs of Police. FRANKLINTON -- Town commissioners agreed to pull nearly $19,000 from its savings account to hire a new officer this fiscal year. The decision on Tuesday night didn't come without two warnings, though. Commissioner Anita Fuller warned the board that they need to be mindful of pulling money from its fund balance. "It's a slippery slope," she said, noting that once you begin pulling money from that account, it becomes easier to do -- to the detriment of the town's fiscal bottom line. YOUNGSVILLE -- A Youngsville officer has been placed on administrative leave while the Wake Forest Police Department investigates allegations of cyberstalking. Youngsville Police Chief Daren Kirts confirmed that Officer Dwayne Collins is on leave and the part-time officer is not working. Kirts confirmed that investigators in Wake County had taken out a warrant on Collins regarding a charge of cyberstalking, but it had not yet been served. LOUISBURG -- The county's two oldest rescue squads have closed, but county emergency services officials say urgent transport will remain open to those in all corners of the county. Franklin County did not renew franchise agreements with the Louisburg and Franklinton rescue squads at the end of 2015 after leaders in those units notified emergency services staff that they didn't have the volunteers or finances to continue.